Another return today. 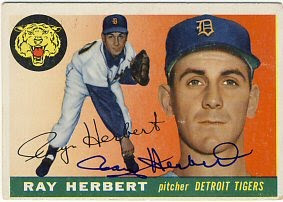 Ray Herbert signed his 1955 and 1959 Topps for me in 10 days. I don't have any recent requests out that I'm expecting back, and don't expect any time to send any for quite a while. 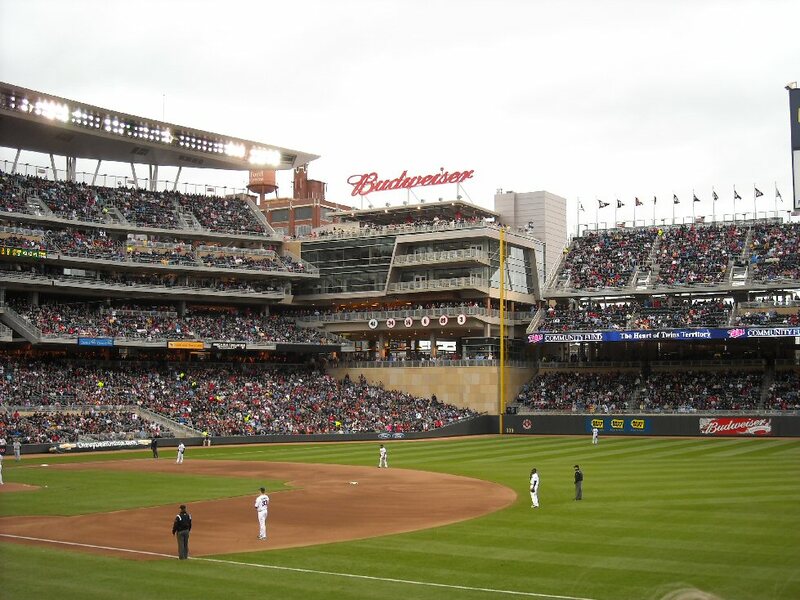 Beginning June 1st, we have one or two baseball games every day for 28 days straight, including tournaments on weekends. The only days we might not have any games would be on Sundays if my sons don't do well in their tournaments. Last week I mailed out a couple of requests. Today I got one back. 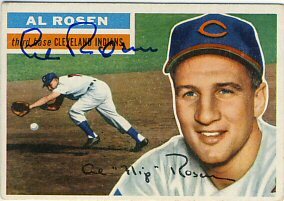 Al Rosen signed his 1956 Topps for me in 8 days. 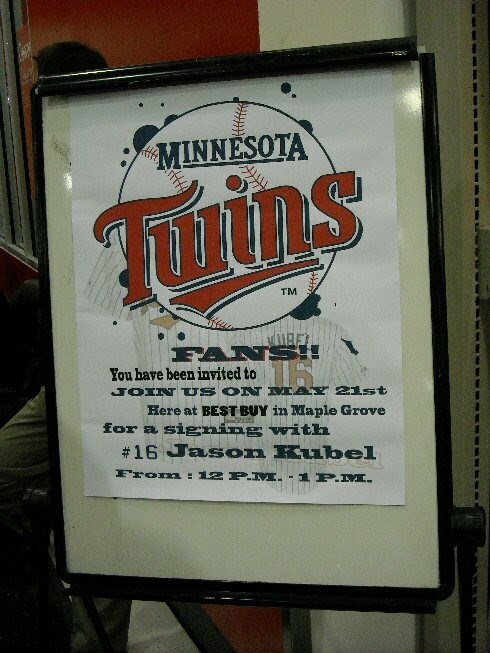 After buying four tickets to the Twins Autograph Party, I found out that Killebrew won't be signing jerseys. That was the main goal for me and my older son. Also, since buying the tickets, my older son's baseball team signed up for another tournament that is the same weekend. I'm not sure what I'll do yet. Maybe my younger son and I will go even though he didn't really want to. Maybe I'll be there by myself. I'm not sure yet what I'll do with the other tickets. 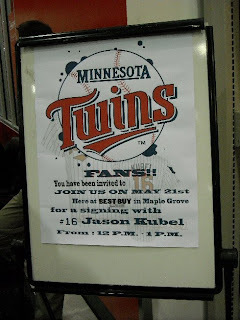 Today my wife of 15 years and I celebrated our anniversary by driving an hour to the Best Buy in Maplewood for a Jason Kubel autograph signing at noon. Well, it really wasn't a celebration, but I took a day of vacation so we could spend the day together and she agreed to spend it this way. We also snuck in some shopping, a little of which was for her, and we had lunch together, so it was nice. At least for me. Anyway, we got to Best Buy at about 11:25 for the noon signing. There were already quite a few people in line, and by the time he started signing, the line wrapped all the way around the store and out the door! It was a single file line, so it wasn't really as long as it looked, but I was amazed that so many people were there on a weekday. 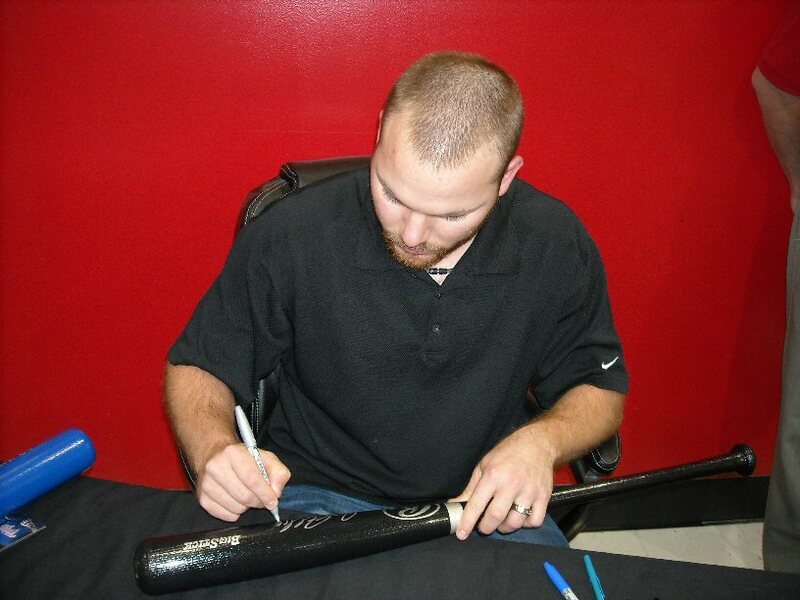 The first time through the line my wife and I each had him sign a black Rawlings Big Stick bat for our sons. They were surprised and happy to get them when they got home from school. After we got through the line, I thought we'd probably have time to get through again and sure enough, we got through the line by about 12:50, about 10 minutes before the signing ended. 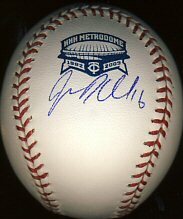 I had him sign a 2009 Metrodome Commemorative ball, partly because I still have about a dozen left, and also because my favorite memory of seeing a game live at the Dome was when he capped off hitting for the cycle and completed a huge comeback by hitting a grand slam against the Angels last April. 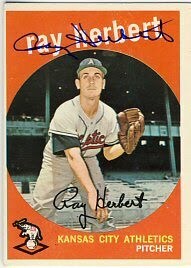 My wife had him sign a 2010 Topps Heritage for me. By that time, there were only a few people in back of us, but I decided not to be greedy and we headed off for lunch. 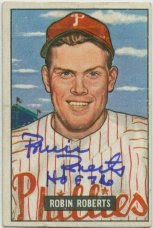 Today I received a 1965 Topps signed by Albie Pearson. I sent this in to a private signing held by Chris Potter (http://www.chrispottersports.com). I've sent in several items to Chris, including Jim Perry and Jim Maloney (which I should get back pretty soon). I haven't got a lot to share, but I have a few things to catch up on. 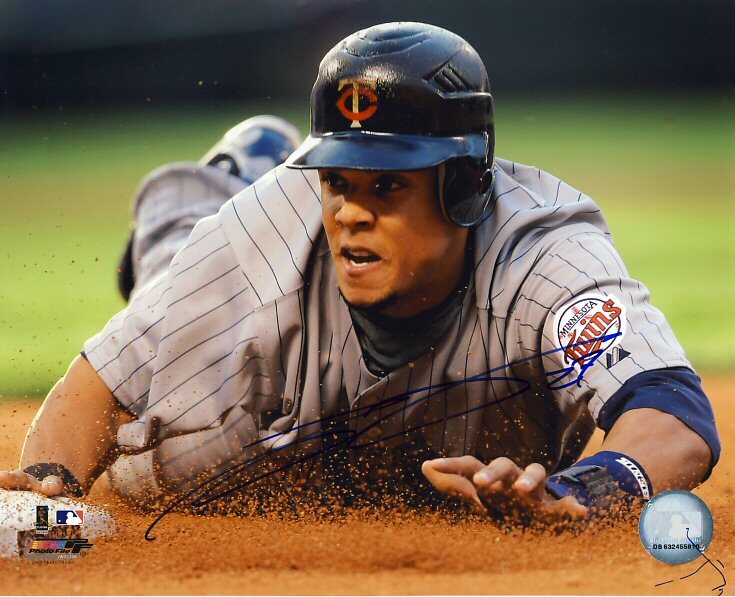 First, a while ago my son got back a Carlos Gomez picture signed during Spring Training that the guys at GateX autographs took care of for us. I had also sent in one for myself, but they weren't able to get that one signed. Gomez's signature is horrible, like most current players, and he signed it in about the worst spot possible, because it's dark. Oh well. The picture itself is really cool. 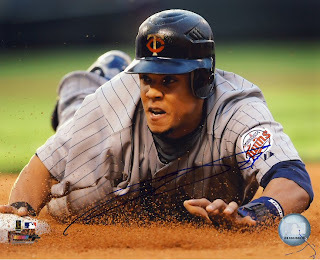 Today I ordered our tickets for the Twins Autograph Party on June 12th. $43 each, with "convenience fees". Ouch. Johnny and I want to get Killebrew to sign our throwback jerseys, which will be $20 cheaper than TwinsFest. Johnny also wants to get Killebrew to sign the picture of Killebrew with Hank Aaron, on which he spent his life savings getting Aaron's autograph. I also have a picture I want signed, as well as a Wheeldon print, but Johnny also wants a bobblehead signed. My younger son and wife will help get a couple of these other items signed. Lastly, I wanted to mentioned that Hall of Famer Robin Roberts passed away on May 6th. 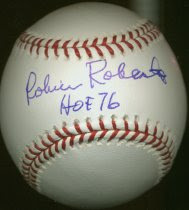 I have several autographs from Roberts that I've received through the mail over the last seven years that I've been collecting. He signed for a small donation for B.A.T. (Baseball Assistance Team). 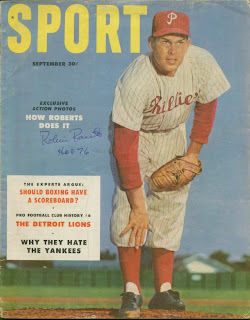 It's guys like Roberts that I've really enjoyed learning about and writing to for autographs. 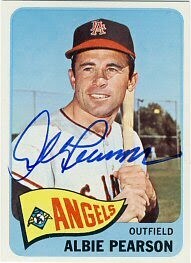 I find it much harder to get interested in the guys from the 70's and later, so I find myself becoming a little less interested in the hobby as each old timer passes away. 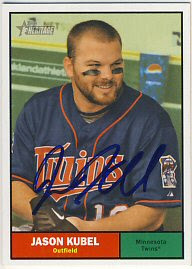 Eventually I'll probably just collect current Twins players. I have been very busy lately with my sons' traveling baseball schedules and weekend tournaments, as well as traveling for work so I have not sent out any requests. I may get a few minutes to send out 2 or 3 today before we head out to my son's baseball game this afternoon. 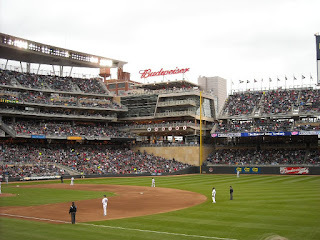 On Wednesday of last week I took a half-day of vacation and headed out to Target Field to watch the Twins beat the Tigers. A colleague of mine has a pair of season tickets and was called out of town, so he gave them to me and another colleague of mine. Thanks again Jeff! The weather was cold and rainy so I was a little worried about how comfortable it would be. It was also very windy. We parked at the Fort Snelling Park & Ride and rode the Light Rail to the field. This was also my first ride on the Light Rail. It was okay, but VERY crowded. 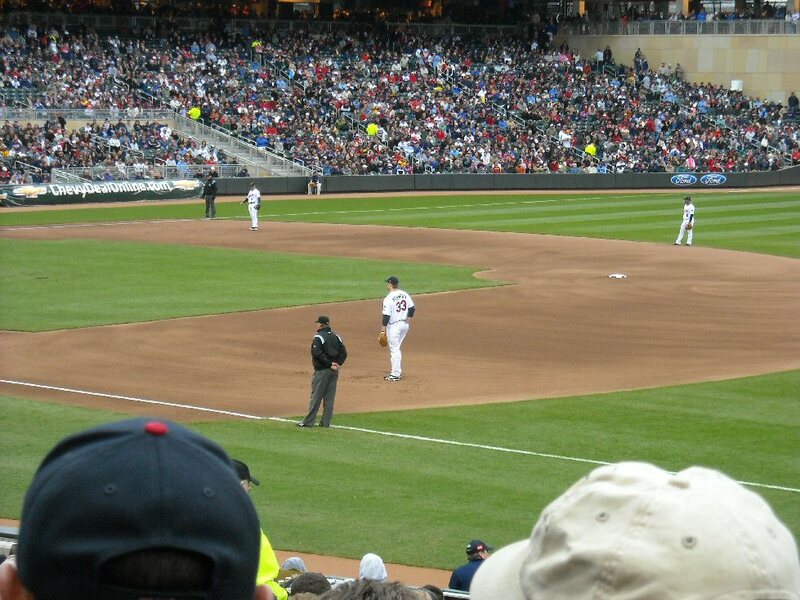 To my surprise, the game was packed. Announced as a sellout, it was hard to walk around the concourse due to all the people, and the lines of people waiting to buy food. The gate we entered was on the other side of the field from where are seats were, so it took us a bit of time to make our way to our seats. Before heading down to our seats, we grabbed a hot dog and drink. Nothing fancy, just the plain hot dog and chips. I didn't take the opportunity to look at all the different food options or sample any. I did notice the walleye fingers and fries, which I might try next time (for $9.50). 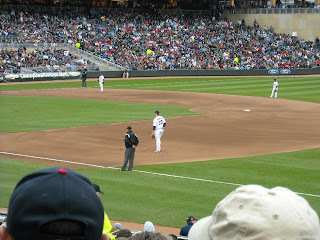 Our seats were in section 104, beyond first base, about a third of the way down the outfield line. They were great seats. 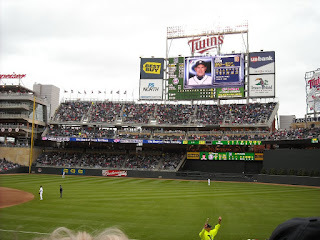 The best thing is that they were actually positioned facing the infield, so you don't have to sit with your head turned to the side to see the infield, like you had to at the Dome. We seemed to be somewhat protected from the wind and I was pretty comfortable, although I had dressed for the occasion. 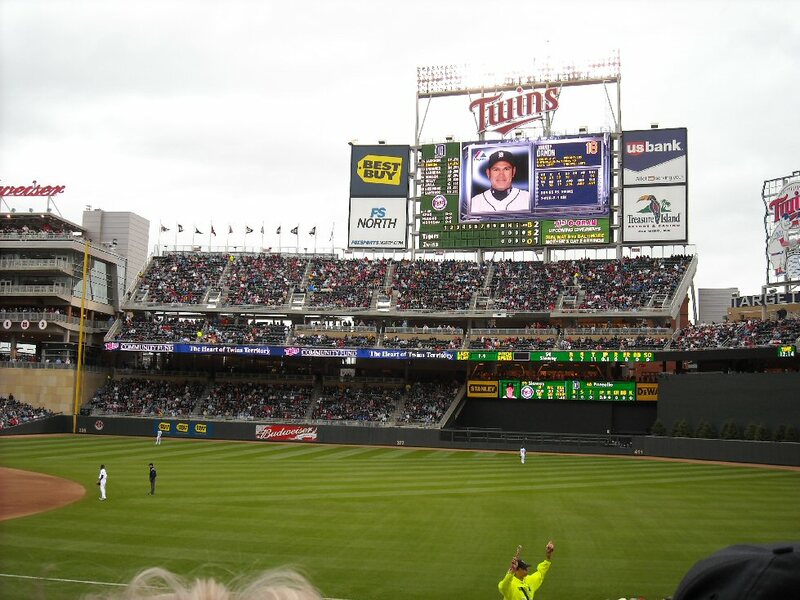 The scoreboard/video screen is amazing! It's like a giant HD TV. My favorite part of the stadium is the big neon sign out in center field with "Paul" and Minnie". 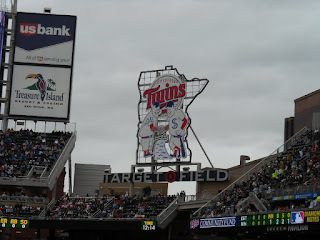 I'm glad they included a retro feel to the park, which is also evident by the banners along the fences outside that have giant reprints of Twins baseball cards on them. My younger son went to last night's game against the Orioles and ran into Tony Oliva on the concourse. He and his friend got their picture taken with him. They were pretty excited. My wife and other son have yet to visit the new field. We'll do our best to get them there later this year.